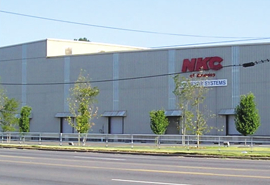 NKC of America, Inc. was the first overseas subsidiary of the NKC group to be formed. NAI was originally established in Memphis, Tennessee in 1980, as a sales office for the Conveyor Division.During the 1980's, many Japanese auto makers or our prime customers opened their plants in the US. In order to meet their needs, NAI expanded in 1985 to include NKC's first overseas manufacturing facility. Today, we continue to design, manufacture, install, and service NKC conveyor systems throughout the US, Mexico, Canada and South America with the same high level of commitment as given in Japan. 1584 EAST BROOKS ROAD, MEMPHIS, TN 38116 U.S.A.
1572 EAST BROOKS ROAD, MEMPHIS, TN 38116 U.S.A.